The George S. & Stella M. Knight Essay Contest is a national event. Conducted at the Chapter, State Society and National Society levels, students must submit an original essay with topics based on original research about an event, person, philosophy or ideal associated with the American Revolution, Declaration of Independence, or the framing of the United States Constitution. More information is available here or from our state chairman. of the contest are held by Chapters and/or State Societies to select one winner from each participating state for the national competition. Prizes also may be awarded to winners from the Chapter and State Society. The Illinois SAR winner for 2015 was Joseph Cozzi from Fenwick High School. Click here to contact state chairman. Each year, the Illinois SAR recognizes the state's Outstanding JROTC Cadet. The winning cadet receives a $1,000 award and will be entered into the national competition. Cadets are nominated by local Illinois chapters and are required to write an original essay by the Cadet, of 500 to 700 words, the topic is: “How has JROTC prepared me to be a better citizen of the United States of America.” The JROTC Award is presented to the Outstanding Cadet in their next to last year of JROTC in a four year program at their high school (or a second year cadet in a two-year program). The program is designed to allow all candidates to be evaluated equally regardless of the Military Service they represent. At the chapter level, 85 high school programs are honored by the Illinois SAR, including a JROTC program in Japan! The winning cadet of the National program is recognized by the National Society Sons of the American Revolution at Congress where he/she receives the National JROTC Medallion and a check for $1000. (The second place winner receives an award of $500.00) For more information on the Illinois JROTC program, contact our state chairman. The SAR ROTC medal is approved by the United States Army, the United States Navy, the United States Marine Corps, and the United States Air Force. Each service has notified its ROTC Units of this approval and has authorized presentation to its cadets or midshipmen. 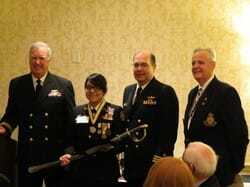 The award can be presented by a state society or a chapter to students enrolled in ROTC programs. 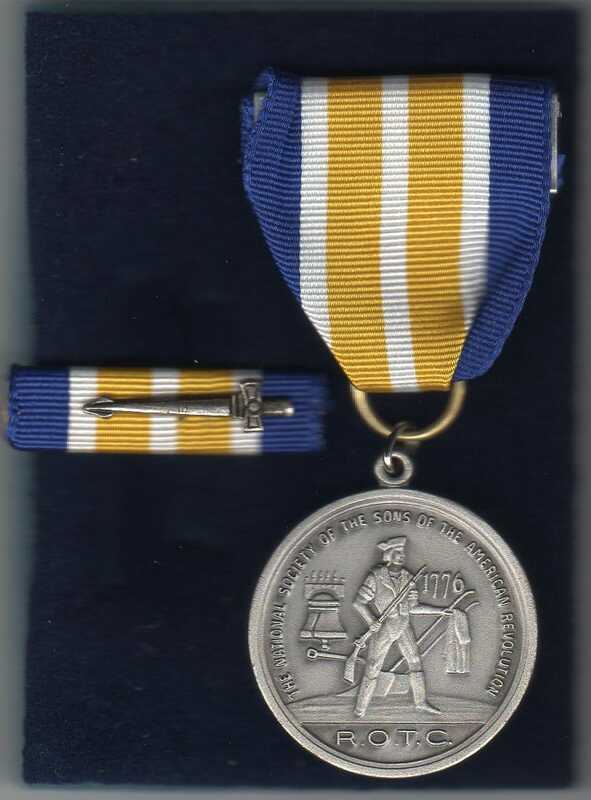 The medal endeavors to foster the principle of "citizen-soldier" exemplified by the Minutemen. Recipients are selected for a high degree of merit with respect to leadership qualities, military bearing, and general excellence. The recipients are selected by the Commander Officer of the ROTC unit. For more information on the Illinois SAR ROTC/JROTC Program, contact our state chairman. The Illinois Society is proud to recognize the outstanding accomplishments of new Eagle Scouts throughout the state for their excellence and good citizenship. Scoutmasters may request a commemorative certificate for an Eagle's Courts of Honor by contacting our state chairman. 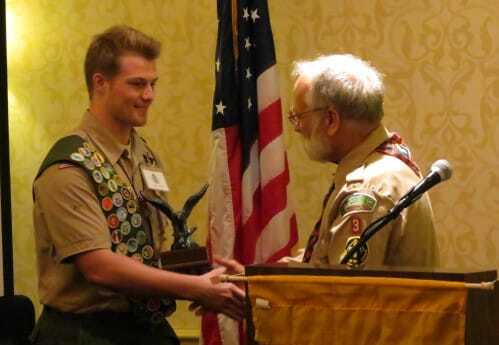 Also, the Illinois and National Societies offer a unique Eagle Scout Recognition and Scholarship Contest at the state and national levels with substantial cash awards. 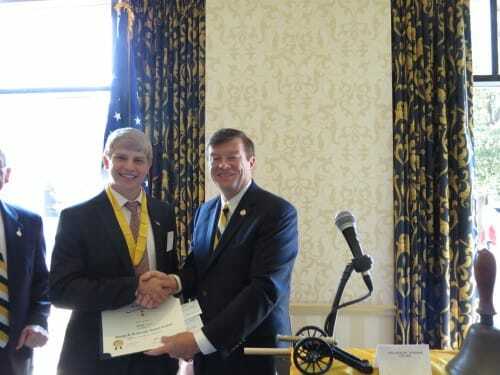 (At the national level, the award is called the Arthur M. & Berdena King Eagle Scout Scholarship.) Young men who achieve the rank of Eagle Scout and demonstrate their belief in our principles of patriotism and American heritage are deserving of special recognition for their accomplishments and dedication. ​The program is open to all Eagle Scouts who are currently registered in an active unit and have not reached their 19th birthday during the year of application. Scholarship deadline is December 31st for applications to be received by the State Chairman. Please check with the chapter closest to you for their specific deadline. You may also submit your application directly to the state society. however, if this is done the you will miss the opportunity to compete for any awards offered at the local chapter level. The SAR Tri-Fold Youth Brochure contains additional information about the various youth programs. The 2018 - 2019 Illinois Society SAR brochure has additional information.